The original plans for the Dunes Oasis Casino was a see though glass pyramid. The finished plan was a round building with tinted glass that made it disappear at night and extenuate its neon signage. Another example of circumstantial magic only available in Las Vegas, the moment I saw @cosmo1261mark's picture, I knew it was Twitpic of the week. While typically it would have been in the running for the accolade in last weeks show, last week's winner was already chosen and had its monolog written before this picture was discovered. So according to the rules I've made up around this whole process, that meant it couldn't be considered for the honor until this week. So, yea for loopholes! 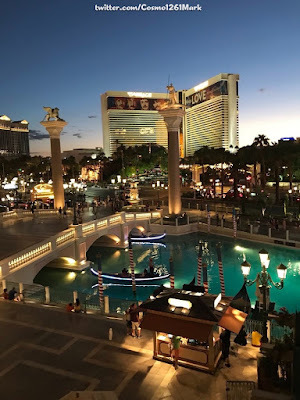 @cosmo1261mark's picture captures a moment in Vegas I have to imagine everyone who loves the city enough to enjoy this podcast has experienced...magic hour. That moment when the exterior lights of the casino compete for attention with the sun while it fades in the distance. But much more than that, it's a reality check. When you accidently step outside of the haze of Vegas glory to realize things are happening out in the real world not nearly is amazing as what you are currently doing. Remembering that there are people, all around the world, who are suffering...because they currently aren't you, in Las Vegas, seeing views like this.